With her famous line, "Huwag Ako!" 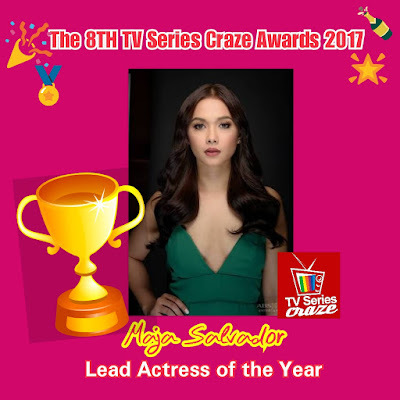 and being known today as Ivy Aguas or Lily Cruz, definitely, no one can beat Maja Salvador to be the Lead Actress of the Year here in our very own The 8TH TV Series Craze Awards 2017. Maja's vengeful character in the hit ABS-CBN Primetime series "Wildflower" is truly remarkable! "Ung mga pasabog niya laban sa mga Ardiente ay talagang inabangan at nag-trend sa world wide web!" Who could forget Ivy Aguas who wore black gown and tagged as the 'Bride in Black' during her scandalous wedding with Mayor Arnaldo Ardiente Torilio (RK Bagatsing)? How about the 'Lady in Gold' when she announced in front of the villains that "Ivy Aguas is dead... Liliy Cruz is Alive. Ako si Liliy Cruz!" with matching, "Black is Out... Gold is in... 'cause Gold is indestructible!" Or maybe you like her bangs when she she revealed who is the real Red Dragon?! Maja is even dubbed now as the new Action Queen in Primetime! Who love to see her doing Muay Thai or fight scenes wearing high heels?! "Yes, siya lang ang nakagawa 'nun many time!" How about her helicopter scene doing a fight above the air?! But of course, many of us really love her catfights with her antagonist Emilia Ardiente Torilio (Aiko Melendez) specially the cake scene! "Hirap nilang awatin dun!" That was also the scene where Maja wounded Aiko's eye. What more can you add? Truly, Maja creates a new record and a new history in the world of TV series by portraying the wildest character of Ivy Aguas / Lily Cruz! She is definitely not only a good drama actress in this series, but also a tougher action star to beat!